With summer just around the corner with it comes fun in the sun, playing sports, and firing up the grill. Maybe you are hosting a BBQ or you’re going to one—avoid the embarrassment of being completely oblivious on how to light a charcoal grill and having to pull out your smartphone to find out how. When in charge of the grill you want people to be confident about your grilling skills and step one is learning how to handle the heat that’s cooking your meat. This guide is written to help you avoid what happened when I decided to host a barbecue. I hope your grilling experience goes better than my first time—I thought I knew what we were doing, but I had no idea and had to shamefully ask my buddy’s dad to get it started. This step is especially important if you are using a public grill—you don’t want whatever mess that was left behind being cooked into your food. Also, don’t be misled and believe that the leftover grease and food particles are going to make your food taste better because it’s just going to make your food stick to the grill and marinate it with ash. Get a stiff wire brush and put some elbow grease into scraping off the ash and remains from the last use. Grates are easier to clean when the particles and the iron are still warm so be diligent and clean it after you’re done grilling. If the stuff just won't come off, wait until the charcoal is ready, and you've placed the grill rack back in. The heat should loosen the gunk. Protip: No wire brush? Ball up some aluminum foil, it'll work when you're in a pinch. On the bottom of your grill are vents. Open them. Simply said, simply done. Make sure that all the ash is evacuated from the bottom of the grill. 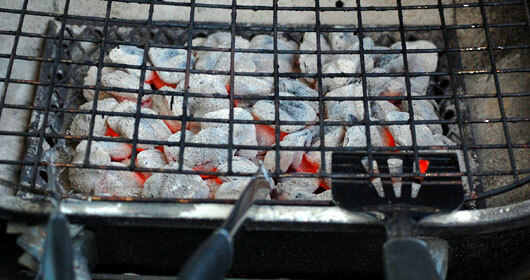 Opening the air vents allows the air to circulate to keep the coals burning once you light them. Protip: The vents also serve as a way for you to control the temperature of the heat while you are grilling. If the food is cooking too fast, lower the heat by closing the vent slightly. To increase the temperature, open the vent. It’s time to show off your pyramid building prowess to the world! Fill the bottom of the grill with briquettes and continue building it up so they are arranged in a conical/pyramid shape with the apex at the center of the grill. 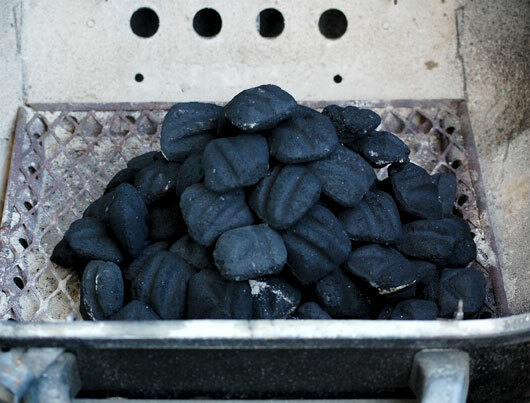 The top briquettes should be your starting point and in an outward circular motion continue to spray the lighter fluid until all the briquettes are adequately covered. You don’t want to oversoak, but not having enough will not provide enough fuel to properly light your charcoal. Let the liquid soak into the coals thoroughly by waiting 5 minutes before taking the next step. Protip: Do NOT add lighter fluid to pre-treated charcoal like Match Light. This type of charcoal already contains an accelerant. Use a long match or a barbecue lighter to light the bottom of the pyramid in several different spots so the heat will end up distributing evenly. It will take approximately 20-30 minutes until it’s properly heated. The coals will burn quickly at first and then die down. Even if it doesn’t look like the coals are lit, they are. Give it time. Protip: Do NOT spray the lighter fluid in hopes of getting it to heat up faster—I’ve done it before and everything tasted like gasoline. Once most the coals are covered with white ash, go ahead and destroy your pyramid of fire by using your tongs to spread the coals to cover the surface of your grate evenly. 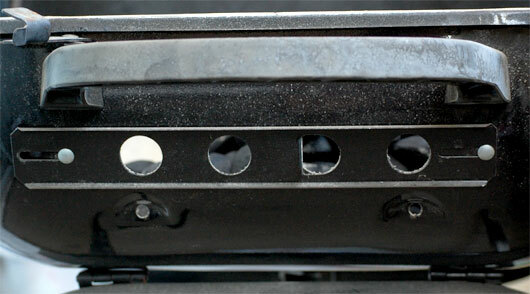 Place the grate in position and clean off any of the stuck on gunk that wouldn't come off before. There's an easy method for telling how hot your fire is. Hold your palm 4-5 inches above the fire. 2-4 seconds, that's hot, somewhere between 400 and 500°F. If you add new charcoal to your already lit fire it can give your food a funny taste. Instead, you should let the new charcoal burn separately, then add it to your grill once it's ready. Do not add more lighter fluid to the grill once the charcoal has been lit. Now you should be ready to take on the world and start grilling up those fantastic cuts of meats and vegetables. Most of all though you just set yourself apart from those who don’t know where to even begin to cook with a charcoal grill. Now to look like an expert, you can get yourself a charcoal starter—now that’s legit. Stay tuned in the following weeks as we cover how to grill different cuts of meat and some awesome vegetables. Christopher Tran is a New York transplant by way of San Jose, California. A lot of blogging, a lot of sports loving, a lot of photography, and a little Asian. Aspiring to find the perfect balance between working, brewing beer, eating, and searching for the perfect burrito in New York City. You can find him at his blog ChrisMTran and on Twitter @tealsharkie. Have you ever used a chimney? They’re so much easier to light, you just need a piece of newspaper, no lighter fluid. I agree with Greg and Charlie. No one likes grilled food with a lighter fluid after taste. Newspaper + Chimney + Wicked Good Charcoal should be the “Primer” way to grill. A chimney starter is amazing! I’ll make it 4 for 4! I use a chimney and hardwood chunk charcoal as well. But if I’m doing just hot dogs, then I’m using briquettes. Also, for large pieces of meat that take hours to cook, briquettes are also better since they do burn longer and can be controlled at a lower temp. Food for though (pun intended). I concur, chimney starters are amazing! Add wood chips to that mix too. That being said a lot of people plan barbecues last minute and head to their local market for charcoal and lighter fluid. I read this totally expecting you to introduce the readers to the magic of a chimney starter ($15 at Lowe’s). 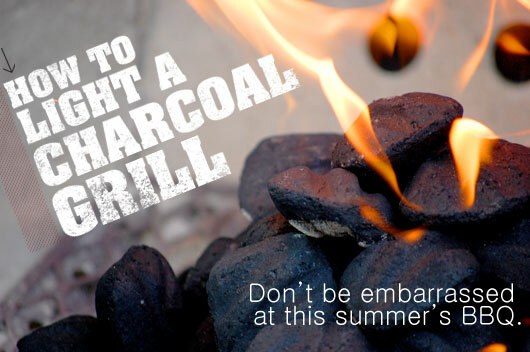 Use it to light your charcoal without stinking up your grill (and eventually your meat) with lighter fluid. Good information otherwise! Agreed, go buy a chimney if you plan on doing ANY grilling in the near or distant future. They’re cheap and will help to improve your grilled goods for years to come! Chimney not only 1 but 2, always have coals ready for whatever, more heat, trashcan turkey, dutch ovens, friggin awesome, also get a long tongs and leather heat resistant gloves, My boyscouts patrols each have one and they rock tooo. I don’t agree with having an even layer of coals. Might I suggest a two-level fire/grill? Slope the coals high from one down to very little to no coals on the other end. This allows you to cook with even more indirect each on the low end for foods that take longer to cook and are likely to burn if any other avenue is taken (e.g., chicken). The hot end can take care of foods that are better seared (e.g., steaks) and then moved over to a lower portion to cook to desired temperature. Not only can you use the chimney starter for other cooking mediums, you can use IT as a cooking medium as well. If you want to cook seafood on the grill, it’s best done with a hot, fast cook. A low and slow grilling (like you’d use for four legged land beast) will dry it out. Here is where the chimney starter/jet engine reigns supreme. Use a little spray on vegetable oil and the grill from your Weber and cook for a couple minutes on each side. I got the idea from Alton Brown on Good Eats (by which I mean I am essentially quoting him) and it really does work amazingly well. Your blog is so helpful.. We will have a camping trip in our yard.. lol And we will apply your tips here..